Although I don’t have The Ring magazine’s complete archives or a quick way to get in touch with Larry Merchant to confirm this, I’m fairly certain that Saturday’s light-heavyweight unification match between IBF champion Bernard Hopkins and WBA champ Beibut Shumenov is the most high-profile match between two Muslim boxers since Dwight Muhammad Qawi defeated Matthew Saad Muhammad in August of 1982 in the second of their two WBC light-heavyweight title fights. 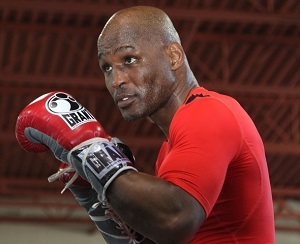 Hopkins, the 49-year-old ageless marvel, will be looking to make history again this weekend. If he beats the 30-year-old Shumenov in the DC Armory in Washington, D.C., Hopkins will — for the third time — become the oldest man in history to win a world championship. Also featured on the Showtime televised card is an up-and-coming Muslim boxer from New York, undefeated (18-0) welterweight Sadam Ali. The 2008 Team USA Olympian will face veteran Michael Clark on the Hopkins-Shumenov undercard. Tagged as: Beibut Shumenov, Bernard Hopkins, boxing, Dwight Muhammad Qawi, Islam, Matthew Saad Muhammad, Muslim, Quran, Sadam Ali, Washington D.C.